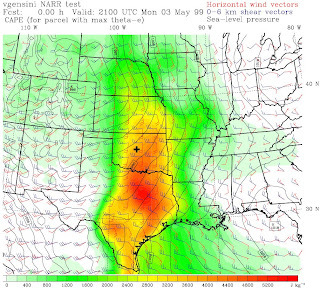 A cold and rainy Friday-Saturday in AHN led to a rather 'nerdy' 36 hour marathon of learning the ropes of the WRF and RIP software (RIP is a post-processing package). I've found that grad-school (especially when you are living by yourself), can lead to these moments of 'in depth,' 'in the zone' thinking that are better left blossoming. I'm sure that many other students that have been here before can attest to this. While not necessarily useful right at the moment, I am sure that these tools will come into use during my dissertation. Anyone who is familiar with my current research knows that I love to look at historical atmospheric states (or simply, weather history). Specifically, I like to examine those states that are favorable for the development of severe storms. One way researchers can examine this history is through the use of reanalysis data. Reanalysis is an assimilation of all data available for a particular time, then a modeled "best guess" of the atmosphere is produced. Obviously, as one goes back further in time, these approximations of the atmosphere become difficult due to the lack of observations (i.e., the National Weather Service didn't start launching weather balloons until the late 1930's). 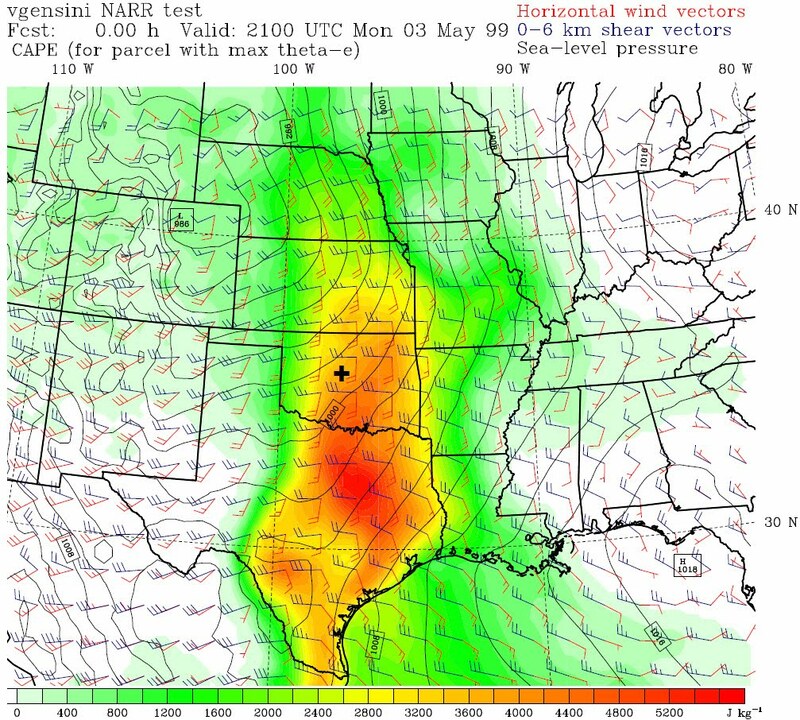 While nerding out with WRF, I decided to pull some data from 3 May 1999, one of the most well known tornado days in history. I won't go into much detail regarding the environment, as it has already been published on extensively. Rather, I'll offer some eye candy of the 2100 UTC environment as diagnosed by reanalysis. 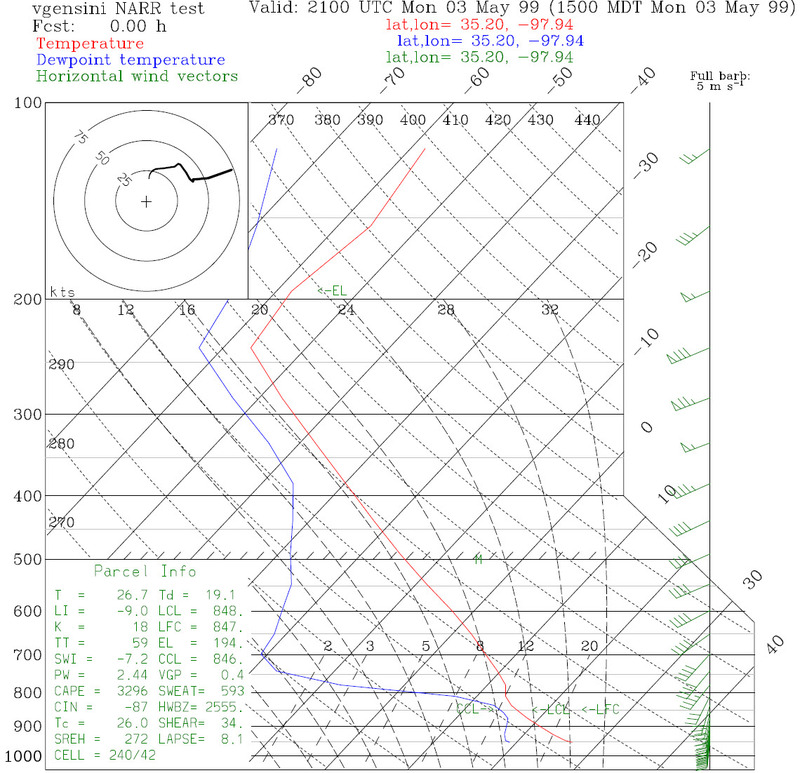 The black "+" in the above image is roughly where the sounding below was calculated. 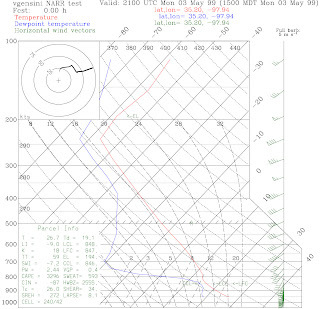 The exact lat/lon is printed on the sounding graphic, but it is roughly near Chickasha, OK.